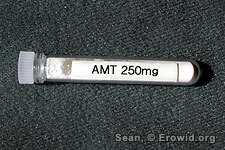 AMT is a long-acting, synthetic psychedelic and euphoric stimulant known for causing nausea and vomiting. It was first developed in the 1960s and remained very uncommon until the 1990s when it experienced a surge in popularity and was scheduled (made illegal) in April 2003. WARNING: Some users and sellers have confused AMT and 5-MeO-AMT resulting in unpleasant and/or dangerous overdoses. Are 5-MeO-DIPT or AMT scheduled/illegal in Canada?